How Do Creatives Parent and How Do Parents Create? These are ChiIL Mama.com's original video interviews with a wide assortment of professionals in the music and theatre industry who are also parents. We've asked parents in metal bands, punk & funk bands, kindie rock, theatre production, directors, actors and more just how becoming parents has influenced their creative work and vice versa. Here are their words on how both worlds collide and how to strike a balance. **You might also want to check out fellow blogger, Lindsay Maines, who writes Rock And Roll Mama. 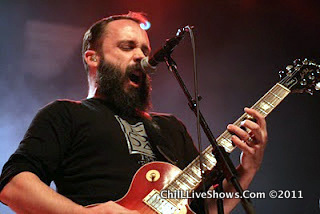 She's married to the bass player for Clutch! Blast from the Past: Click here for our original Clutch show shots from Congress Theatre, Chicago when they opened for Black Label Society with Children of Bodom.